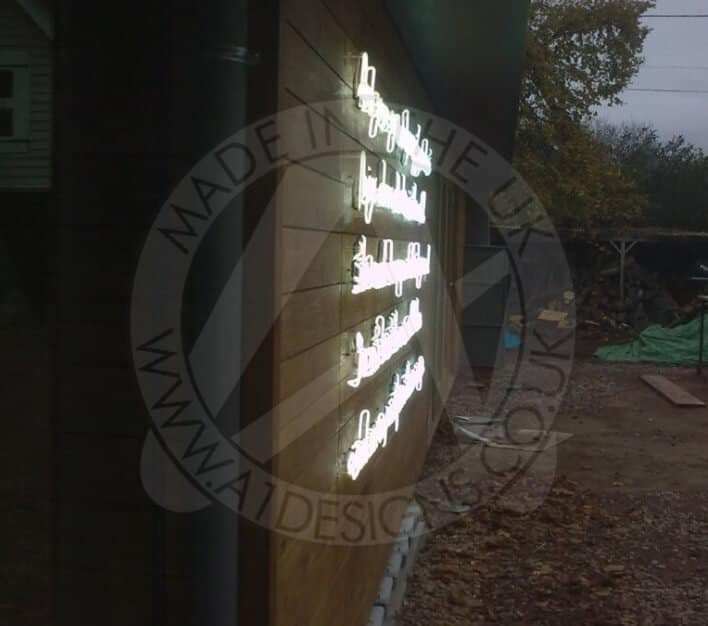 With its strikingly unique look and unbeatably warm glow unlike any other light source, it is no surprise that many people are turning to neon signs to bring some colour and life into their businesses and more recently, their homes . If you want to make the most out of your neon, you will most likely want to have it displayed in an area where you can show it off on a regular basis. If you are looking to simply add a bit of colour to your home, then straight sections of neon are ideal to be placed either around your ceiling, or in a cove to have the warmth radiate out into the room. Recently converted one of your spare rooms into a game’s room or man cave? Or simply looking to liven up a room you spend a lot of time in with guests? Either way, a neon sign is a great way to add some colour and fun into your home. Neon draws the eye in a welcoming manner, the light is easy on the eyes and is guaranteed to be a talking point with your guests. If you are throwing a party, a neon sign is the perfect centrepiece. With flashing capabilities, you can draw the attention of anyone in the room. Alternatively if you are looking to have a quiet evening with a few friends, the dimming option of neon helps create a nice calm relaxing environment in which to entertain. Whatever the intended purpose, a neon sign will be remembered by your guests. As with many things, the hardest choice is often not whether to have something or not, but rather what to have. Your imagination is the limit with neon. With each tube being bent by hand, almost any font style or design is achievable. Whether you have a design in mind, only have a rough idea or have no idea at all, here at A1deSIGNS we can help make your neon dream come true. With an in house design team, you can collaborate to achieve the sign you want and as every sign is made by hand at our factory here in the UK, you can even come and watch your sign get made. Feel free to get in touch with us to start discussing your neon sign today!